Tim Cook started Apple’s press conference with a surprising statement. 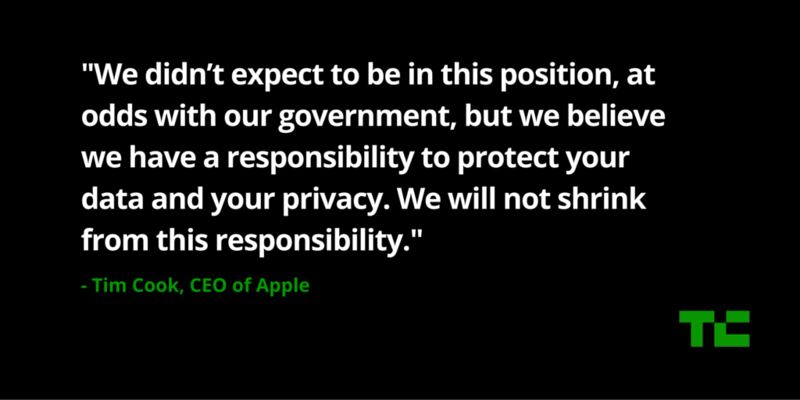 After announcing that there are now 1 billion active Apple devices, Apple’s CEO then talked about the ongoing conflict with the FBI. Apple has made it clear that the company doesn’t want to unlock the iPhone 5c involved in the San Bernardino case because it would compromise the privacy of millions of users. A backdoor for the FBI is a security hole, and hackers could take advantage of it. “A month ago we asked Americans across the country to join in a conversation. We get to decide as a nation how much power the government should have over our data and over our privacy,” Cook said. By releasing a letter, Apple has taken a strong stance on this issue. It has become part of the public debate for the past month, and the company will be at its first hearing tomorrow in California.